Long ago a wealthy old man named Hikaru lived in a village in Japan. Hikaru’s house stood just beyond a cemetery. He lived surrounded by a beautiful garden. Hikaru was polite and elegant, never unkind, but he had never married. He lived alone; he seldom ventured out into the village, and his neighbors gossiped about him. “He must be mad,” the men muttered. One year, just after midnight on New Year’s Eve, Kyoshi dressed up and prepared himself to go make Hatsumode, the first trip of the year to the temple. There he planned to pray for good things in the coming year. Just as he was about to enter the temple, he saw something that took his breath away. 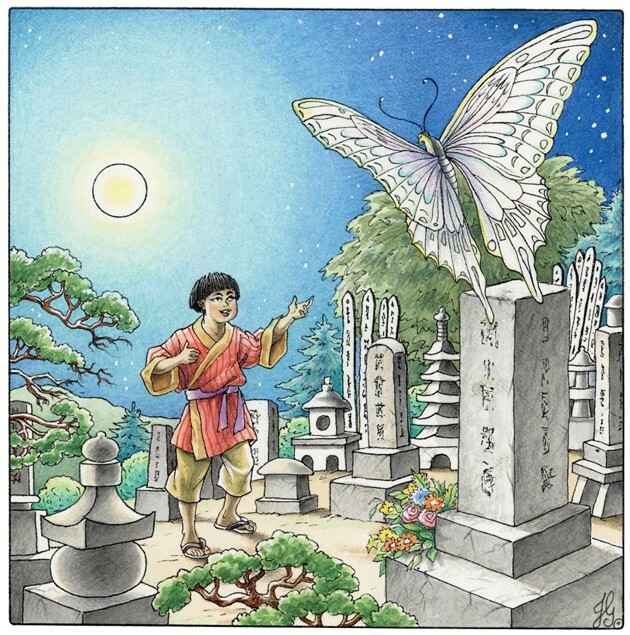 The air outside was cold, the wind was brisk, the moon was bright, but there at the door to the temple hovered a white butterfly, its wings shimmering brightly. When his mother heard this news, she too lost her breath. “Are you certain?” she asked. “Why, Mother, why?” he asked as they walked toward the cemetery and beyond, to Hikaru’s house. “Wait, we shall see,” his mother shushed him. They knocked upon Hikaru’s door. After a long wait, they heard footsteps slowly approaching. When at last the door opened, Kyoshi gasped. Hikaru was as pale as a ghost, so thin and frail it seemed he would fall to the ground any moment. The poor man was dying, and as soon as he lay down, he appeared to fall asleep. But just at that moment, to Kyoshi’s amazement, the white butterfly appeared in the room. It hovered over Hikaru, and Kyoshi tried to brush it away. “There it is!” he cried to his mother. “The butterfly!” Again he brushed at it with a fan, but the butterfly only swooped around the room and once again flew to the bed. There it landed on the pillow beside Hikaru’s head. Kyoshi crept close and brushed his hand over the writing on the stone. He squinted and made out the name. (begin itals)Akiko(end itals). “What are you doing here?” he asked the butterfly. He saw his mother was weeping. “Hikaru has passed away,” she said. His mother took his hand and told Kyoshi the tale of Hikaru’s love. She had heard the story when she was young, and then she had forgotten it. But the moment she heard of the white butterfly’s appearance in winter, she remembered. Kyoshi listened, and tears fell from his eyes. “He was never mad,” he said softly.